Tiger Woods may have lost in match play last week in Austin to Lucas Bjerregaard, but that's not likely the last time we'll see him matched up one on one with another golfer this year. Sure, he might make a Presidents Cup team he's the captain of, but it also appears that Woods could be participating in more made-for-TV matches similar to his $9 million fiesta with Phil Mickelson last fall. The matchups would be in conjunction with his partnership with GOLFTV, and the first one will take place in Japan. Woods signed a deal with Discovery -- which owns GOLFTV -- at the end of 2018, in case you're wondering about where all of this is coming from. Here's Golf Digest with more on what this might look like going forward with Woods, who has earned more than $110 million on the course in his time on the PGA Tour. Speaking at the CAA World Congress of Sports, (Discovery president and CEO David) Zaslav said the first match has already been planned for Tokyo and that most of the events will take place outside the United States. Woods and GolfTV, Zaslav said, will also "play around with the format." "Should it be one-on-one? Two-on-two? Should we have two matches going on at the same time? But he's all in," Zaslav said. So there is a lot of freedom for growth here, it seems, and a lot of purposeful ambiguity over how all of this is going to play out. 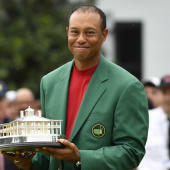 It makes sense for Woods, although it may rob of us of more of the best Phil Mickelson stories like we saw after Lefty won 90,000 one-hundred dollar bills in Las Vegas last November.